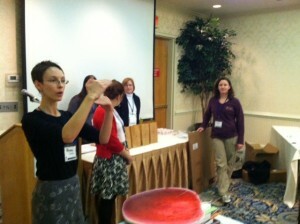 Rhoda Switzer, a teacher at an independent Montessori school in Maryland, recently created a comprehensive book list about agriculture, gardening, and everything in between for a Nutrients for Life workshop at the Maryland Association for Outdoor Education Conference (MAEOE). As a whole, children today know less and less about where their food comes from and what it takes to get food on the table. But teachers like Rhoda Switzer are working to educate students on the importance of agriculture in their day-to-day lives. In the spring, her students work on Lesson 5 of our Nourishing the Planet in the 21st Century elementary curriculum: Planning a Garden. Ms. Switzer sees the value environmental education, such as having a vermicompost bin as a classroom pet and integrating environmental lessons into her classes. Her school is also developing and installing a new playground for the school, in which they aim to have certified as a Nature Explorer space through the Arbor Day Foundation, and maintaining a butterfly garden. Below is an excerpt from her book list; do you have other books to suggest for teaching soil science? The Man Who Fed the World: Nobel Peace Prize Laureate by Leon Hesser: Norman Borlaug and His Battle to End World Hunger Dr. Norman Borlaug, one of the world’s greatest heroes, is the most highly-decorated individual of our time. He is credited with saving over a billion people from starvation. Dr.Borlaug is only one of ﬁve people in history to win the Nobel Peace Prize, the Presidential Medal of Freedom and the Congressional Gold Medal. In addition, Dr. Borlaug received the Padma Vibhushan, the higest civilian award the government of India can present to a non­citizen. The Man Who Fed the World has won three nation book of the year awards: USA Booknews best Biography of the Year. The American Farm Bureau for Agriculture BestBook of the Year award, and Florida Publishers Association Best Book Award. Roots, Shoots, Buckets & Boots: Gardening Together with Children by Sharon Lovejoy: Use with Nutrients for Life’s Nourishing the Planet in the 21st Century curriculum when planning your garden, interesting garden designs including a pizza garden, snacking & sipping garden, moon garden, ﬂowery maze,a garden of giants, Mother Nature’s medicine chest, and a Zuni wafﬂe garden, alsoincludes container garden ideas. Carrots Love Tomatoes: Secrets of Companion Planting for Successful Gardening by Louise Riotte: A second volume written as a companion to Roses Love Garlic, very handy in gardening planning, the idea of plants liking and disliking each other intrigues children, sections on soil improvement and pest control are especially helpful. A Dyer’s Garden by Rita Buchanan: If your class gets inspired to plant a garden full of plants which can be used for natural dyes this book is an excellent resource, includes many plants, their scientiﬁc names, growing conditions, how to use the plant stuffs to make dyes, which mordants touse, and color photos of the dyes side-by-side on various types of fabric. Sunﬂower Houses: Inspiration from the Garden by Sharon Lovejoy: Most notable for including a ﬂoral clock garden design with plants which blossom at a certain of the day arranged in the shape of a clock. Worms Eat My Garbage by Mary Appelhof: The deﬁnitive resource for setting up a vermicomposting bin, including different bins,what kind of worms to use, preparing worm beddings, what kind of food to feed the worms,harvesting worms, and making potting soil from the vermicompost produced. Earthsearch by John Cassidy: Nonﬁction book, Elementary grades, this unusual geography book is ﬁlled with hands-on activities to get across its essential ideas, most relevant to the teaching of soil science is the information on the population explosion and how many humans we will needto be feeding in just a few decades, helpful demonstrations of exponential growth. And the Good Brown Earth by Kathy Henderson: Picture book, Primary/Elementary grades, beautiful endpapers showing the venation of leaves, a young boy and his grandmother go to the garden all throughout the year to see what is happening: “digging time” “thinking time” “planting time” etc., “the good brown earth got on with doing what the good brown earth does best” refrain. Apples by Jacqueline Farmer: Picture book, expository text, Elementary grades, explains the agricultural process of growing apples, varieties, nutrition, history, includes apple facts and recipes. Corn Belt Harvest by Raymond Bial: Picture book, expository text, Elementary grades, detailed information about corn and how it is planted, harvested, and used, includes a diagram of the corn plant and some corn recipes. Farmer George Plants a Nation by Peggy Thomas: Picture book, Elementary grades, this beautiful picture book presents a new side of George Washington, end papers show a map of his farm at Mount Vernon, GW’s revolutionary farming ideas including the famous sixteen-sided barn, his exercises in breeding mules, and thoughts on using manure and crop rotation for soil augmentation, excerpts from his own writings are sprinkled throughout the text. The Gardener by Sarah Stewart: Picture book told as a series of letters, Elementary grades, takes place during the Great Depression when a little girl is sent away from her family to live with her uncle in the city, she cheers up her grumpy uncle by planting a beautiful surprise rooftop garden, show the joy and power of growing beautiful things, use if you are planting containers. Planting a Rainbow by Lois Ehlert: Picture book, Primary grades, use with Nutrients for Life curriculum when planning your garden, focuses on the colors of the plants to make a rainbow garden. Wiggling Worms at Work by Wendy Pfeffer: Picture book, Primary/Elementary grades, explains how worms work underground to loosen the soil and feed the plants, includes a guide for further activities, nice tie-in with a vermicomposting bin in your classroom.